[S267] James Junius Goodwin, Goodwins, Page 163. [S267] James Junius Goodwin, Goodwins, Page 140, Item 44. [S267] James Junius Goodwin, Goodwins, Page 108, Item 4. [S267] James Junius Goodwin, Goodwins, Page 140. Princess Eugenie Victoria Helena was born on 23 March 1990 at London, England. She was the daughter of HRH The Prince Andrew Albert Christian Edward Duke of York and Sarah Ferguson. 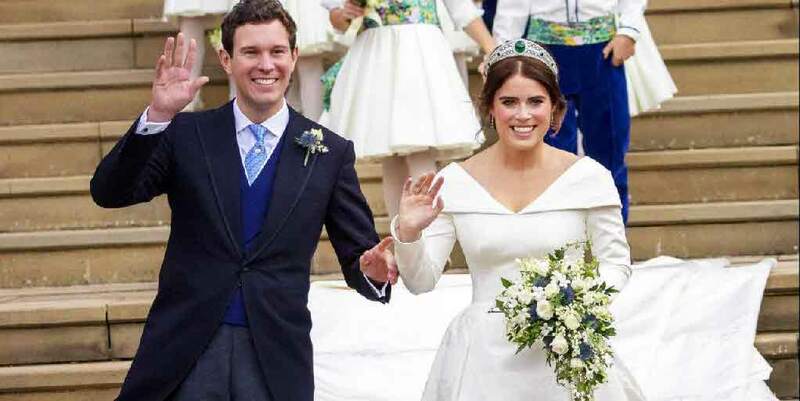 Princess Eugenie Victoria Helena married Jack Brooksbank on 12 October 2018 at St. George's Chapel, Windsor Castle, London, England. Eleazer Goodwin was born say 1703. He was the son of Nathaniel Goodwin and Mehetable Porter. Eleazer Goodwin was baptized on 19 December 1703 at Hartford, Hartford Co., CT. He married Hannah Easton.1 Eleazer Goodwin died on 19 January 1766. [S267] James Junius Goodwin, Goodwins, Page 367, Item 476. [S267] James Junius Goodwin, Goodwins, Page 271, Item 300. Hannah Vail was born say 1740. She married Ozias Goodwin, son of Abraham Goodwin and Mary Bird, on 26 October 1761. Hannah Vail died on 4 November 1822. Mary Bird was born say 1711. She married Abraham Goodwin, son of Nathaniel Goodwin and Mehetable Porter, on 13 April 1726. Mary Bird died on 7 June 1788. Samuel Goodwin was born on 28 May 1746 at Wintonbury, Hartford Co., CT. He was the son of Stephen Goodwin and Sarah Gillet.1,2 Samuel Goodwin married Rebecca Loomis, daughter of Capt. Reuben Loomis and Rebecca Goodrich, on 8 February 1770.3 Samuel Goodwin died on 18 January 1784 at age 37. [S267] James Junius Goodwin, Goodwins, Page 440, Item 700. [S267] James Junius Goodwin, Goodwins, Page 440. [S137] Elisha Scott Loomis, Joseph Loomis, Page 167, Item 976. [S137] Elisha Scott Loomis, Joseph Loomis, Page 167, Item 374. [S137] Elisha Scott Loomis, Joseph Loomis, Page 167. Never married; lived in Edmond, Ok in 1920. Frank Holcombe was born circa 1877 at KS.1 He was the son of Ludolphus Holcombe and Mary Lamme. Evelyn King was born on 29 May 1874. She married Alonzo Holcombe, son of Ludolphus Holcombe and Mary Lamme, in 1890. Evelyn King died on 4 March 1910 at age 35. Following her divorce in 1920, Beulah took her son Richard, and left Evelyn and Robert with John. She and John had lived in Soux City, IA. John Mackey Keith was born on 11 January 1892. He married Beulah Faye Holcombe, daughter of Alonzo Holcombe and Evelyn King, on 26 November 1913. John Mackey Keith and Beulah Faye Holcombe were divorced in 1920. John Mackey Keith died on 12 October 1970 at age 78. Robert was out of contact with his family for many years and no one knew where he was, other than to think it was California. Later he did contact his mother. He was married, and had four children, but left them in California. In younger years, lived in Arnolds Park, IA (married there). Managed a roller skating rink. His sister says he was an excellent skater and very handsome. Robert Hussey Keith was born on 7 December 1914. He was the son of John Mackey Keith and Beulah Faye Holcombe. Robert Hussey Keith died circa 1972. Richard Harrison Keith was also known as Richard Harrison Riner. Richard's name was changed from Keith to Riner when his mother divorced John M. Keith and married Wesley Riner in 1920. Richard served in WWII and sang in a barbershop quartet. He died from complications from Parkinson's Disease, which resulted in a fall while hospitalized. Frederick Haasz married Lucia Post, daughter of Dr. Asa Post and Mary Holcombe, in September 1810.1 Frederick Haasz died on 28 November 1831 at Elizabethtown, Essex Co., NY. Carrie Evelyn Jones was born on 16 October 1917. She married Richard Harrison Keith, son of John Mackey Keith and Beulah Faye Holcombe, on 9 February 1942. Carrie Evelyn Jones died on 1 March 1992 at age 74. Wesley David Riner was born circa 1886. He married Beulah Faye Holcombe, daughter of Alonzo Holcombe and Evelyn King, in 1920. Wesley David Riner died on 16 October 1961. Henry Glen Hedde was born on 13 July 1887. He married Beulah Faye Holcombe, daughter of Alonzo Holcombe and Evelyn King, on 18 May 1935. Henry Glen Hedde died in April 1968 at age 80. Elbridge and Helen lived in San Franciso on Arago St. for many years. He owned a food delivery service there, worked one the Pacific Coast Stock Exchange, and was a member of the San Francisco Rose Society. He stayed in San Francisco when he was discharged from the service. He had entered when he was 17.